It’s Thanksgiving week! Do you have your holiday menu planned out? If you are hosting or have you been invited to Thanksgiving dinner at someone else’s home you still need to have a plan. We have been invited to our son in laws sister’s home and we are very excited to be part of a larger family gathering. Today I will share with you what I will be making and taking with me. Sorry it is so last minute but life is quite busy right now and I squeeze in what I can when I can. Our extended family do not eat a plant based diet but they go out of their way to accommodate our food choices. I’m a tough guest with being gluten free, oil, free and vegan! I can only imagine the stress that creates for anyone who has me as a dinner guest. I am sure people wonder what on earth do you eat? Our hostess and friend Annie will be making a vegan Butternut Squash Soup for the appetizer for our holiday meal. I will be bringing a vegan/plant based entree, salad and dessert. Our daughter Katy is bringing a vegan vegetable side dish and a vegan dessert. Hands down this is our favorite Shepards Pie recipe so it was an easy choice to make! It is made in the Instant Pot pressure cooker. It is super delicious, filling and everyone – plant based or not enjoys this casserole. It is a comfort dish for sure. I love that you get lentils, veggies and mashed potatoes all in one serving. As a side note, if you have the Breville Smart Oven Air – it will accommodate a 9 x 13 inch casserole dish as long as it doesn’t have large handles. This recipe can be found in the Vegan Under Pressure Cookbook. If you don’t have that cookbook click on this link for The Veggie Queen website and the recipe is posted there. I do use my own Instant Pot Garlic Mashed Potato recipe instead of the one in her book. 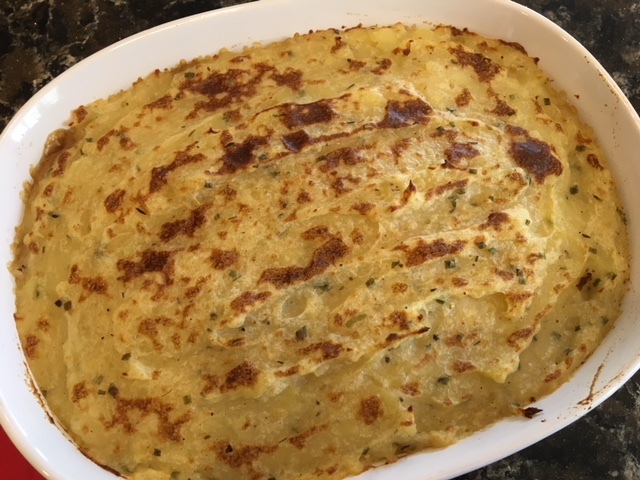 To make the Shepards Pie recipe Chef AJ Ultimate Weight Loss compliant I skip the flour – the lentil mixture thickens up plenty well on its own – simmer it a bit if you have extra liquid that needs to evaporate. Instead of the worcestershire and tamari simply use balsamic vinegar and table tasty or some other no salt seasoning instead of salt. The French lentils can be found in the bulk bins at Whole Foods Market. If you can’t locate them at this late date I have also used the regular green/brown lentils and the dish is still delicious. This recipe is a crowd pleaser and it turns out lovely every time. 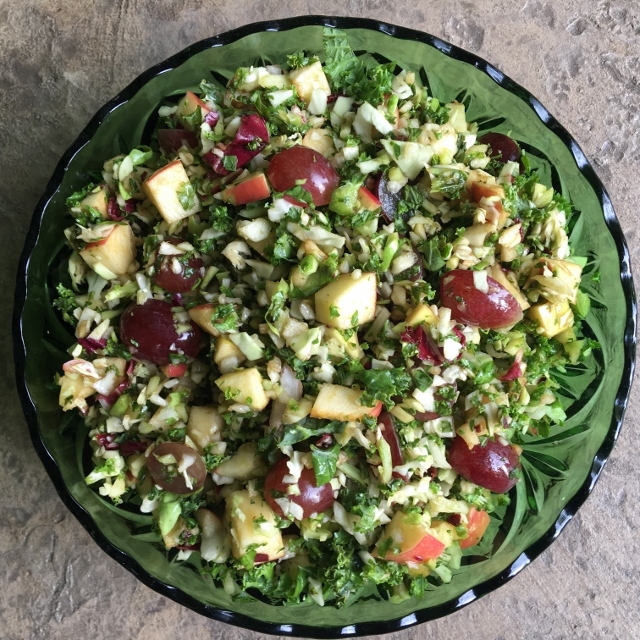 Sweet Apple Kale Slaw is the perfect salad for Thanksgiving. It uses simple ingredients – can be made in a few minutes and everyone loves it. It is so fresh. Sweet without being overly sweet. Crunchy with the apples and the cabbage. 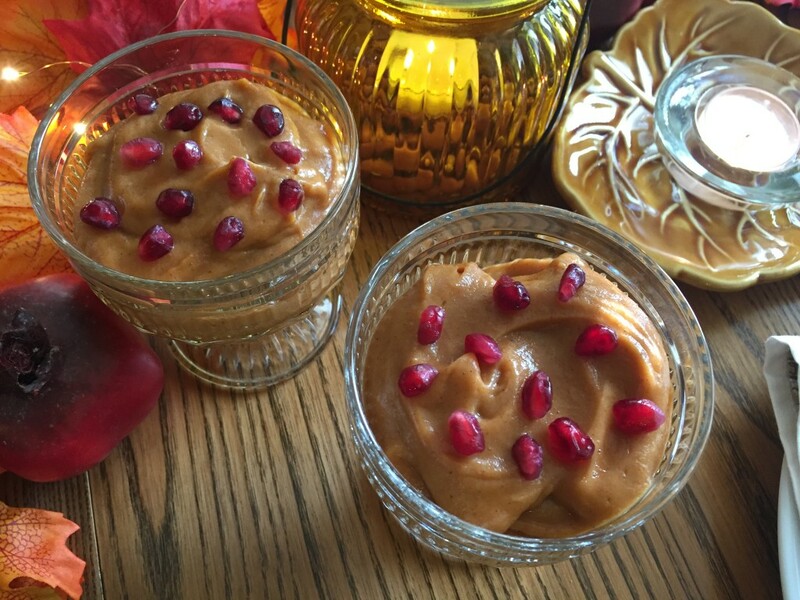 For the holiday I will add some Pomegranate Seeds and maybe some unsweetened dried tart cherries. You can have a small dish of chopped pecans on the side for people to add to the salad if they wish. Fall Pudding is pure joy! A satisfying sweet treat doesn’t have to be complicated or take a long to make. My little granddaughter “Sweet Pea” likes to help me make this dessert. Of course she takes pure delight in helping eat it too! It can be served as you see here or it can go in a pie shell. 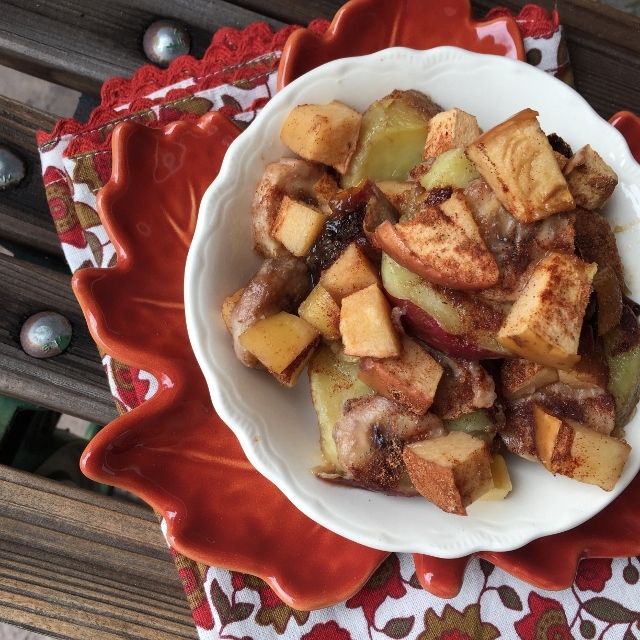 Check out the recipe here for Fall Pudding. Go ahead and make a double batch so you will have plenty of leftovers. It really is that good. I bought some cute little footed plastic dessert dishes at the 99 cent store that will make a nice presentation. The top can be garnished with Pomegranate seeds, fresh raspberries or granola. If you want an awesome Vegan Lentil Loaf for Thanksgiving this one from Eating Bird Food is outstanding! I have made it as written and I have made it subbing oats for the nuts. I actually prefer it made with all oats and no nuts. I skip the oil and use date syrup instead of maple syrup. It is so scrumptious – best lentil loaf ever! Make my Garlic Mashed Potatoes to go with it, some green beans or Brussels Sprouts and you have a holiday meal to live for. 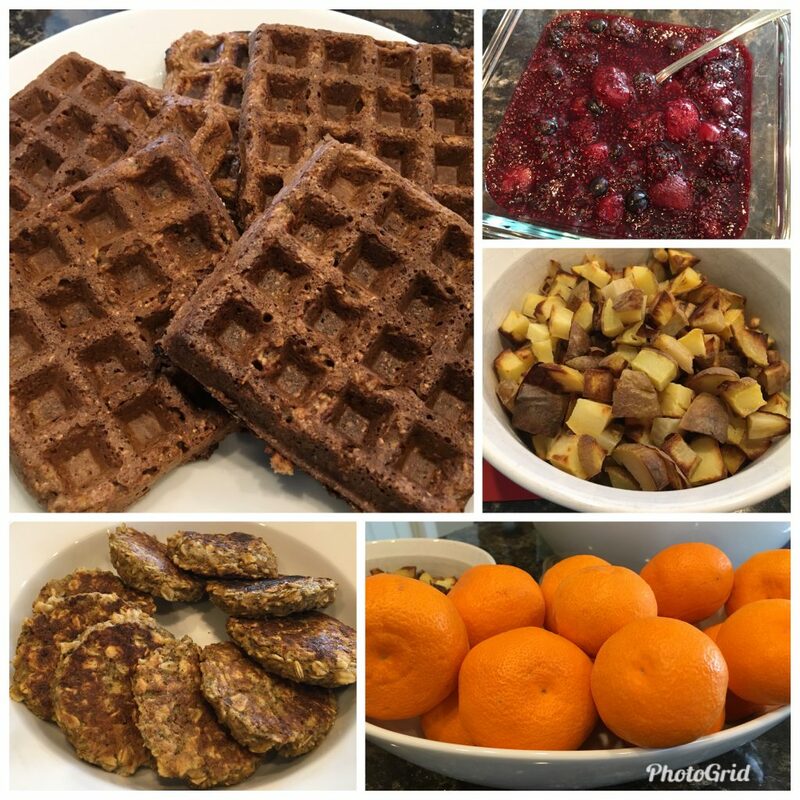 If you are having guests over night for the holiday I have a nice Brunch Menu that is easy to execute and a fabulous way to start the day. Here are a few more ideas for your holiday cooking. Air Fried Stuffed Baby Bellas and Garlic Mashed Potato Balls are to die for! Great appetizers. This is one of my favorite salads for a gathering. 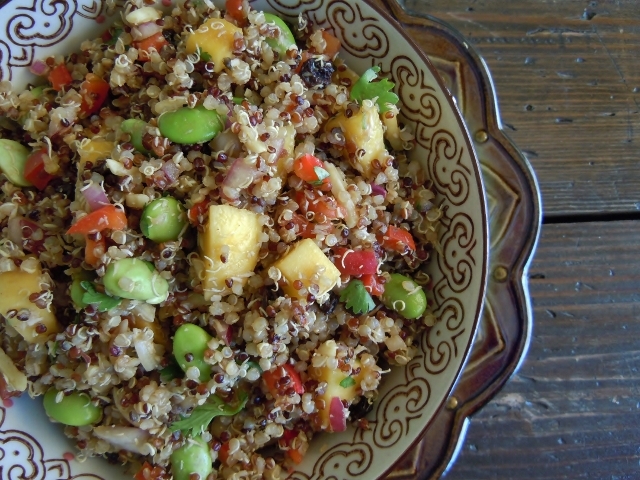 California Quinoa Salad – easy to make but big on flavor. It is hearty enough to stand in as a main dish if it ends up being the only vegan option on the table. This is a show stopper entree recipe! 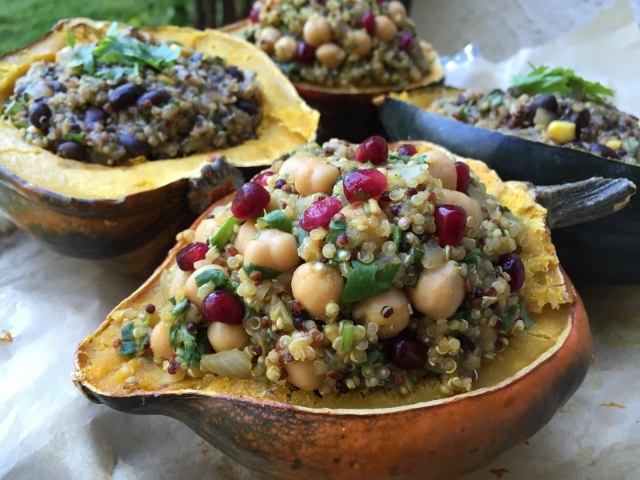 I bought Acorn Squash today just so I can make a double batch of Curry Quinoa Stuffed Acorn Squash! This can be a holiday main dish and just look at how beautiful it is. Simply add a salad and your meal is complete. You will be the envy of everyone at the table. It is so flavorful and filling. Did I mention how pretty it is? Tom and I love, love, love this recipe! You must give it a try. You will be shocked at how delicious it is – plus it makes your kitchen smell really nice while its baking. I might try adding a few fresh cranberries to my next batch and maybe a few pieces of pineapple. Yum! Check out the recipe for How Sweet It Is. Whatever you decide to make for the holiday meal will be fine. It really shouldn’t be all about the food. The focus should be our family, friends and being together. The food doesn’t need to be the main attraction. Make sure you have some activities planned. We usually go for a family walk after we eat but it’s going to be raining on Thursday here. So we will have to come up with inside activities. Board games, puzzles, watching home movies, making home movies, playing with the kids, art projects looking at old photos and so on. There are so many more things to do than just sit around and eat all day! Wishing you all a blessed Thanksgiving! Get healthy and stay healthy one meal at a time. Looks super yummy!! Happy Thanksgiving, Tami! Everything sounds so good! 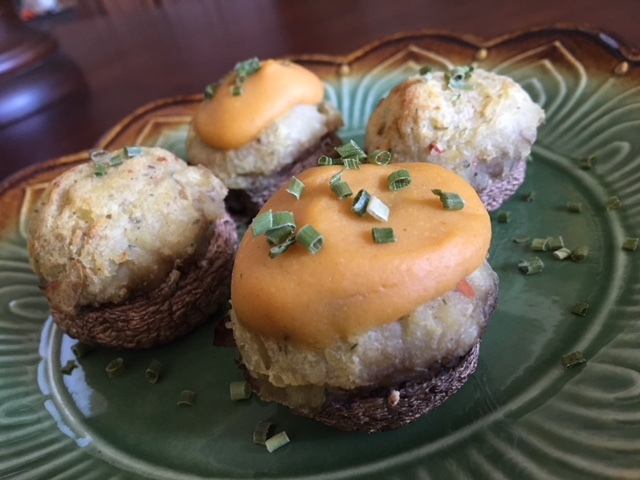 I am looking forward to making the stuffed mushrooms!